Tutorial – How to install Cydia for iOS 8.3 with TaiG jailbreak? This is how to install Cydia for iOS 8 – 8.1.2 on iPhone, iPad & iPod Touch devices using latest TaiG jailbreak -Untethered. 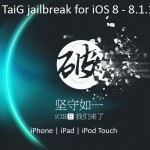 Here you can TaiG download and jailbreak your iOS. Latest Cydia installer 1.1.16 is bundle with TaiG. The jailbreak process will automatically install Cydia for your device. Please note : make sure, backup your device before the jailbreak start. It will save your valuable data if something got wrong. Also you have to prepare your device before begin the process. Follow the steps bellow, you are safe with us. Very important : backup your device before the jailbreak. Connect your device to computer via the USB cable. Extract the downloaded TaiG program & run on your computer. Program will detect your device. Tick off second check box below Cydia, in the program window to prevent install, TaiG App Store and click “Start” button. After the jailbreak process complete 100%, click “Close” button to exit the program. Your device will reboot and Cydia will appear on your home screen. Now you are successfully jailbreak your idevice with Cydia download and install. Enjoy Cydia with the latest firmware. if u can help me please. I have jailbreak my Iphone 5 throught TaiG but by mistake i have deleted Cydia. Please guide me how i can get back Cydia. Try to find some help in here : How to reinstall Cydia? This may include helpful things for you. How to reinstall Cydia? I need cydia for removing icloud account. But how can I install cydia without closing find my iphone? How do you properly unjailbreak my iPhone 6, without losing a any information? First, backup your device with iTunes. Then, select option “Restore from Backup” in iTunes to restore your device as unjailbroken. keep in mind, you will automatically direct to the latest version – iOS 9.3 and lose jailbreak ability. Also you can use Cydia impactor for unjailbreak your device with jailbreak ability.